Excitement for the DGS track & field season begins with returning all-state jumper, Maddie Manganiello (Sr). 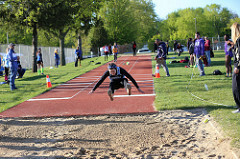 At last year’s state meet, Maddie placed 7th in the long jump. She returns this season with aspirations of finishing in the top 3. Maddie will also join a relatively young sprint crew that looks to gain valuable experience and improve as the season goes along. Other top returning sprinters & jumpers include Clarice Maes (Jr), Mia Burgonio (Sr), Asia Branch (Sr), Katie Meyr (Sr), Hailey Rodden (Sr), and Izzy Taylor (Sr). There is a large freshman group of sprinters that will hopefully make contributions as they begin to learn their events and particular talents. After a great cross country season (5th in the state), the Mustangs expect to once again have a strong distance contingent on the track. Several distance runners are returning with state track meet experience. 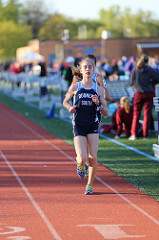 Brenna Cohoon (So) qualified for state in the 3200m last season, and placed 16th. She is also fresh off a breakout cross country season where she earned all-state honors and set a new 3-mile school record. 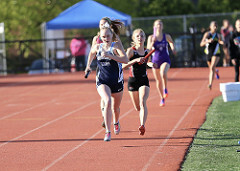 Erin Reidy (So) qualified for state in the 1600m, and placed 24th last season. 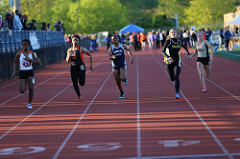 She was also part of a 4x800m relay team that qualified for state and finished 18th. Other returning members of the relay team are Becky Versaskas (Jr), Melissa Weidner (Jr), Alisha Macas (Jr), and Gillian Thomas (Sr). These girls, along with Olivia Duax (Jr), Kelley Hackbarth (Sr), Allison Calek (Jr), and newcomer Rebecca Diddia (Fr), provide the nucleus for a solid distance squad that will look to improve and return to the state meet in several events. Hopefully, all of these athletes and the many not listed here will help the Mustangs achieve a successful season! You can access the Schedule/Results page to find our meet schedule, meet line-ups, and individual results. Previous Previous post: First Meet on Saturday! Next Next post: Batavia Quad Meet Results!